Chouriço is probably Portugal’s most popular sausage. It’s even made by Old Country methods in some of America’s Portuguese communities. 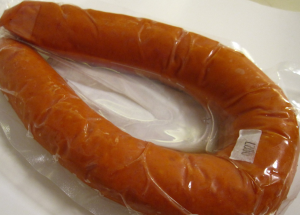 A dry sausage similar to the more popular Spanish chorizo, chouriço is very garlicky, red-brown with paprika, and sold in links about 10 inches long and 1 1/2 inches in diameter. In the fado houses of Lisbon (fado is Portugal’s soul music) grilled chouriços are so much a staple they are know as “fado sausages.” They are brought to the table on little alcohol-fueled terracotta braziers shaped like pigs. The alcohol used to fuel those little chouriço braziers is usually the Portuguese aguardente (fire water, sometimes medronho made from the fruit of the strawberry tree). It’s poured over the sausage on the brazier at the table, the waiter flames it, then you wait till the flames die before digging in. These sausages fairly spurt juice, they are crusty-black after being flamed.